February 2019: Soneva, the world’s leading luxury resort operator, has just completed its latest villa on the island’s sunrise side at Soneva Fushi, the Villa 37 with five bedrooms (total area of 1,823 sqm). The main highlight of this villa is the viewing tower, 11 meters high, reached by a winding staircase with a dining table at the top called the Moonlight Table. This viewing tower is now the island’s highest point and the perfect place to enjoy panoramic views, sunrises, sunsets, dining experiences and star gazing. This villa has a maximum occupancy of 8 adults and 4 children or 10 adults. Architecturally, this villa is very different from the other villas and private residences of Soneva Fushi and is now the benchmark for all future villa buildings and renovations at Soneva Fushi. The master bedroom is located on the ground floor and includes a king size bed, a dressing room with a daybed, indoor and outdoor showers, as well as a bathtub in the outdoor bathroom. From the master bedroom, guests can step straight down into the pool. This villa has an additional outdoor bathroom attached to the guest suite on the ground floor. Three more guest rooms are located on the first floor, all with ensuite bathrooms. On the first floor there is also a guest bathroom, a TV lounge and a gym. There are high ceilings and many windows in the open plan dining, kitchen and living area to let in an abundance of natural light. 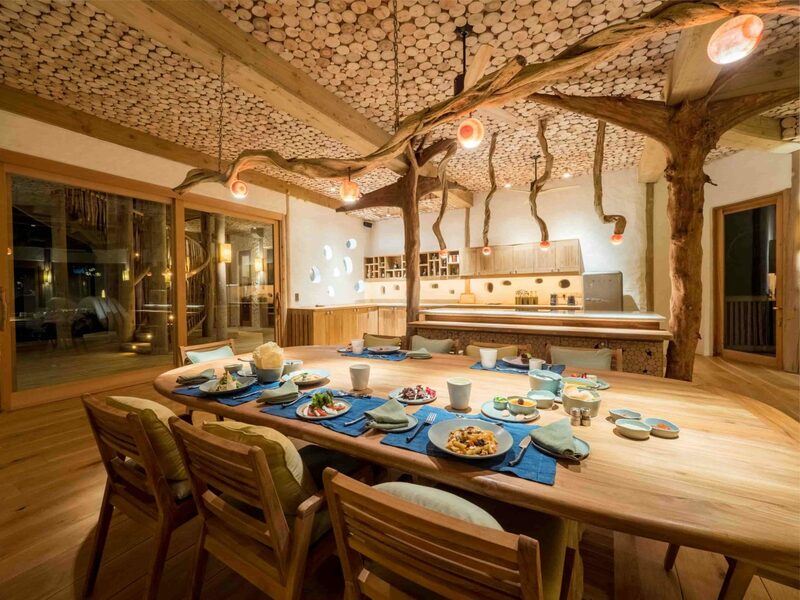 With the roots branching across the ceiling, the support pillars in this large open space, perfect for family gatherings, were fashioned from upside down tree trunks. The ceiling is also covered in tree branch cross sections. From the open kitchen to the 10-seater dining table, the breakfast bar. The kitchen comes with a fridge for your own wine, as well as a minibar and a fully stocked cupboard. The lights above the bar on gnarled vines are suspended from the ceiling. The living room has a deep, curved daybed where the legs and backrest are made up of wooden fish. A library, sauna, shower, steam room and a guest toilet are also on the ground floor. Guests can take their pick from the pool table or the football table for fun and games. The villa comes with a pool of 344 square meters wrapping around the whole front of the villa, which includes a children’s pool of 25 square meters and a water slide. The pool has two sunken seating areas, one covered and one uncovered, as well as a bridge that allows guests to cross from the villa to the sand without having to walk around it. Being on the island’s sunrise side, Villa 37 means guests will have virtually unimpeded horizontal views, with Maalhos’s neighboring island just visible. This villa is one of the private residences of Soneva Fushi under the program of Soneva Villa Ownership. Soneva made history by being the first developer, and still only, to offer foreigners’ luxury homes in the Maldives. At Soneva Kiri in Thailand, Soneva Fushi and Soneva Jani in the Maldives, private residences are currently available. Ownership of Soneva Villa is particularly attractive to guests who regularly return to the Maldives. When rented while owners are away from the resort, the villas achieve a strong cash yield. Capital prices, particularly in the Maldives, rose by around 8% to 10% annually. During their holidays, owners also enjoy the use of their villa, which can add up to a significant amount of savings over several years. Other benefits of ownership include 20% savings on food and drink, motorised water sports, and 20% savings on all flight transfers from/to Malé. The villa is fully maintained by the resort, which includes furniture, fixtures, lighting, gardening, cleaning and pest control repair and replacement. Each residence is the ultimate expression of the signature experience and style that Soneva has become world-renowned for; understated design and luxuriously spacious accommodation, uncompromising quality, service and sensitivity to the environment. All Private Residences are designed to meet the specific requirements of their owner, while remaining true to Intelligent Luxury’s brand mission. Recently we opened up a new avenue for foodies, dubbed as the ‘Hot Pot and Mongolian Hat’ dining experience. Located behind Inguru restaurant, this scenic venue provides a novel communal dining system of the Far Eastern delicacies. But let’s not forget the fine features of the mural wall embellished by tribal art and design, thanks to top upcoming artists Lisa Mam and Peap Tarr. Raffles Maldives Meradhoo has appointed Olivier Larcher as the resort’s General Manager, ahead of its opening. Sleep under the stars in Finolhu Maldives. Those who are tempted by a luxury break in the Maldives and want more from their holiday than a good tan need to take a look at Kanuhura Maldives. In keeping with its “gypset” style the private-island resort has created over 50 activities, which is in addition to eight restaurants and bars and an active childrens’ club. All this in a five-star setting and some of the longest and widest beaches in the country.